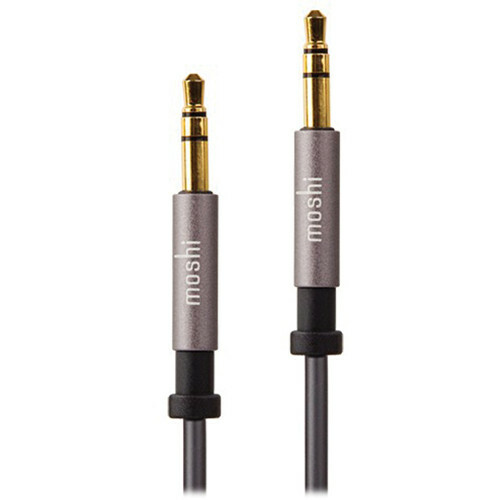 The 3.5mm Male to Male Mini Stereo Audio Cable (6') from Moshi is a convenient cable suitable for a variety of stereo applications. It has standard 3.5mm male connectors, allowing you to connect to any devices with 3.5mm audio jacks. You can use the cable to connect an MP3 player, CD player, or laptop to a set of portable speakers, to a car's audio system, and much more. The connectors are plated with 24K gold for excellent sound quality and resistance to corrosion. The cable is double shielded to reduce electromagnetic interference for static-free performance. Moshi's proprietary HandyStrap cable manager is included to minimize tangles. Box Dimensions (LxWxH) 5.7 x 2.8 x 1.6"
3.5mm Male to Male Mini Stereo Audio Cable (6') is rated 4.5 out of 5 by 2. Rated 4 out of 5 by SodaWerks from 3.5mm M2M Mini Stereo Audio Cab use for aux imput from mobile music player to sound system.